This morning was the second day of the Business Strategy Meeting with Kamlesh Mukherjee, my brother Rajeev, Alyona and my team comprising of Rajeev Matta, Harpal Singh Sokhi, Satyaki Mukherjee and Anupa Das. The meeting was very focused and scientific. Hopefully we are on the right track. After that we had homely food made in our office kitchen. Nothing to beat hot chapattis coming on the plate directly from the tawa! Everyone appreciated the food made by Jaaie and Sheetal. Yesterday, my colleague Rajeev and I had an opportunity to meet Brahmakumari Shivani at their Juhu centre which is very close to my home. Amongst the many topics that we discussed, there were two which were common, and needs mention here, that is, television and food. As was expected, she spoke about Sattvik Food and went a step ahead of the adage jaisa ann, waisa mann by reversing it to jaisa mann, waisa ann! It means your state of mind travels into the food that you are cooking and that food is served to the end user who can be your near and dear ones. So, you have to be very careful that your state of mind is peaceful and happy and you are an emblem of positive energy while cooking food. Such food eaten by anyone would be anyday more beneficial than the food surrounded by negative energy. It is also important for the people who are eating to be in the same state of mind, not to watch the TV while eating, all in family should eat together and if conversation has to happen, then it should be light, avoiding any confrontation or arguments. Respect the food and the food will respect you. Overall, it was an enriching experience and we are looking forward how we can propagate this thought process to the rest of the world using our strengths and platforms. 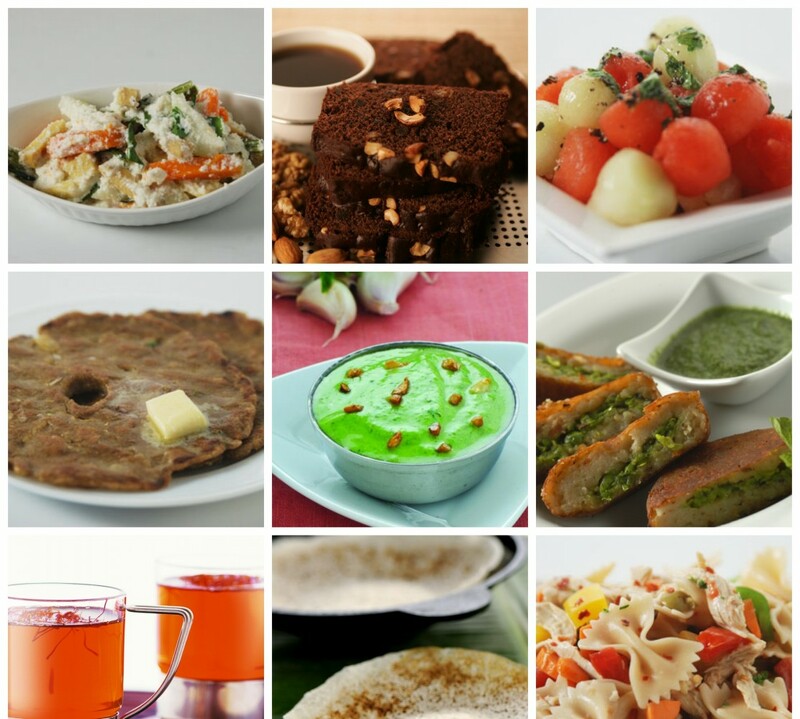 Easy peasy recipes for the lover of Indian food are available easily in books and various websites. But what I have realized is that the best way to make any recipe look easy and doable is to watch it being done, live or a taped version. You can then see the changes in the colour of the food as well as have the pleasure of the aromas when you see a live demo! When it comes to discussing the latest easy Indianrecipes to make there is going to be reams to be written about it! Doing the rounds of late are some main course dishes, that are traditional for most Indians across the country, but somewhat eclectic for those who reside outside the country. Let us look at BesanwaliBhindi: What you should look at buying are tender pods of the ladyfingers that will cook in a jiffy. Best way to treat the ladyfingers is to wash and wipe immediately on buying so that whenever you want to cook them they are ready for use. Preparation requires the tops and tails to be trimmed off so that most of the sticky juices are out of the way. The gramflour gives the dish a delicious crispiness. Well, I love it like this with some dal and rice. Another dish that comes out quick and contemporary in my thoughts is Andhra Chilli Chicken. It is a bit like tandoori chicken but the essential flavour is more of curry leaves and red chillies that give it a character typical of South Indian cuisine. I like the fact that is pan fried in minimal oil and is fairly hassle free to cook. One more of my favourite latest easy Indian recipe is BrownBasmati Pulao. I have switched over to brown rice many many years ago and loving every grain of it to say! This recipe is so simple to follow that I would love even novice cooks to give it a shot. Healthy, fuss free this is a one dish meal that is best accompanied with a bowl of yogurt. Gradually I will take toward more easy Indian recipes. I have many queries about roti/chapatti so let me first guide you how to knead the dough easily. Take out 2 cups of dryatta & a cup full of water. Mix in half a cup of water into this atta. Using your fingers, loosely mix the flour and the water changing it into a crumbly mixture. You can add in a splash of oil. Keep adding water slowly, pressing the heels of your hands firmly into the dough, pushing forward slightly, using the fingers to mix the dry atta well into the wet bits. Keep adding little water and mixing the flour using the fingers and palm, turning it into a ball of atta. Making use of your palms, fist & fingers keep on kneading the atta with pushes punching and rolling it into a desired consistency. If the atta is sticky sprinkle a little dry flour and knead and if it appears a little dry, sprinkle a little water, knead again and smoothen the dough. Keep kneading till it is smooth, soft and quite stretchable. Push a finger into the dough, if it creates a depression and immediately bounces back without leaving the finger sticky, it is ready to use. I will begin with the method of how to roll out the roti and cook it on the griddle easily in my next piece…so if you are a budding cook looking out for basic Indian greats, you are in the right place! Made sure that I had a good night’s sleep last night as I have to get ready for the grand business lunch meeting that will be taking place in my office today. The top-notch executive team of Hungama Digital Media will be here to discuss the future plans. Hungama, the brainchild of Neeraj Roy CEO, serves content to consumers in 47 countries across mobile, internet, IPTV services and has more than 150 partners across the world. 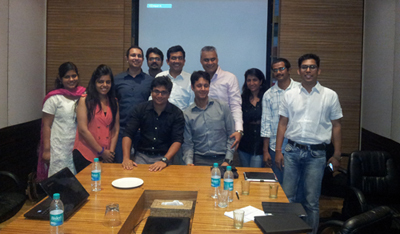 Hungama has successfully managed more than 2000 mobile and digital campaigns for as many as 300 brands globally. Over the years Hungama has reinforced its position in mobile and digital entertainment and marketing. Some of the guests who will be attending this meeting alongwith my team members Rajeev Matta, Satyaki Mukherjee, Adarsh Nigam and Salima Charania are Neeraj Roy, Albert Almeida (Chief Operating Officer), Hungama Mobile; Sunny Virmani (Vice President), International Mobile Business; Hemant Jai (Senior Vice President), Hungama Mobile; Anuj Bajpai (Assistant Vice President), Mobile Voice; Manish Malik (Assistant Vice President), Gaming and Raj Seth (Assistant Vice President), Consumer Products. The team of chefs headed by Chef Anupa Das is preparing a lavish spread starting with a late breakfast, then lunch and finishing off with evening snacks. Breakfast includes vegetarian and non-vegetarian Calzones with an unlimited supply of tea, coffee, juices and soft drinks. Lunch will be both a mixture of Indian and International cuisines starting off with Aam ka Panna served innovatively in cutting chai glasses. Following this, will be a combination of Pasta Salad, Vegetable Biryani, Chicken Biryani with Burani Raita, mukka pyaaz, pickles & papad. Dessert will be a delicious Mango Mousse with Gulab Jamun served beautifully in shot glasses. Finally, the evening snacks will consist of chilled energy-filled Sugarcane Juice in chai glasses along with kachoris and tangy chutney. Then as the day ends, we also have one more meeting lined up for the upcoming book on Chocolates. Photographer Bharat Bhirangi alongwith the food stylist Anupa Das and art director Sachin Bhaukar will be here to meet and discuss about the book, while munching on some tasty sandwiches. More in office – Hungama shoots are also going on. Also, keeping up with the pace of the digital world coming into its full bloom in the near future, we are gearing up in a big way for it. My team gathered for a meeting yesterday for an overview on how we are going to get ourselves digitized in the coming days. They discussed about quality work and the maintenance of it. Some of the processes have already been started and we are putting our best foot forward to get going for the same. All for now, so ending by continuing some recipes keeping in mind the monsoon fever! Back in office for a not-so-hectic-not-travelling day! Have meetings lined up this week and the coming week, before I get going again on the travelling part. My sister is in town so I’m having a great family time since Monday. We had a tasty, tangy and zesty dinner on Tuesday night with my sister and her set of friends – the menu consisted of pani puri, dahi wada, bhel puri, chaat, sev puri, kulche-chole…all the desi way! Today also, went back home for a quick lunch as it’s the last day in Mumbai for her. It’s always nice to have family around and I’m surely going to miss her. But not for long, as my brother and his family is expected to join us here in Mumbai by the next week. Other things – my team had an interactive and informative Food Quiz last week. Our HR helped to organize the entire event and everyone enjoyed it thoroughly. Teams of two members each were formed to play some multiple choice questions. Congratulations to the team of Chef Anupa Das and Priyanka Bose for nailing it! Amongst this, I finally could get some time to interact one-to-one with my staff. I spoke to them about our laurels and upcoming projects, just to keep all of them aware about what all is happening and what’s new in our company. Then, finally we ended with a tea session, where-in some of the members of the office shared their dreams, and how and what to do to fulfill them! We ended on a light and fun mode by sharing some jokes, funny incidents, all of us together with a hearty laugh. A much needed session it was! Also, video shoots are doing the rounds for Hungama Digital Content. The team of chefs are cooking up various quick and tasty dishes for the same. It was great to meet Mr. Jeffrey of Zumba Fitness, who at the age of just 30 years, has been instrumental in spreading this particular form of exercising into more than 110 countries. It was a splendid event. 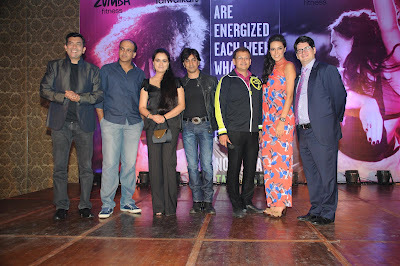 I and Alyona enjoyed the presentation of the Zumba form of dancing by the first set of Zumba Fitness certified trainers. It was simply a treat to watch them. Alongwith this, the food and hospitality was warm and good. Met many friends of my old acquaintances there like Neha Dhupia, Mahesh Manjrekar, Ahustosh Gowariker, Padmini Kolhapure and Rajeev Paul amongst others, who were present there to enjoy the event. Then today, I will be back at the last day of shoot of Sanjeev Kapoor’s Kitchen. All and all once again, it was a great schedule with some new and innovative recipes. Thanks to my team who co-operated and worked for a good show this time as well! 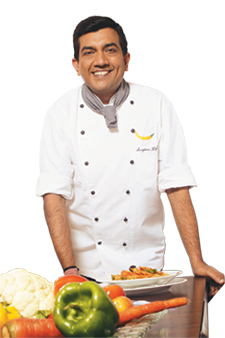 Also, on the occasion of touching the 400 million mark on the Sanjeev Kapoor Facebook Community, I want to thank all my fans once again and make them feel special by running a contest from June 11 to June 16, 2012. Two lucky fans everyday now get a chance to receive a goodie bag consisting of a personalized cookbook and a T-shirt. The fans will be selected randomly, and the only criterion for you all to win this, is to make sure you have Lady Luck by your side! So, here’s wishing you all the best! Just stepped in Mumbai after the successful launch of Signature restaurant in Dubai, and there’s one more reason for me to get extremely happy and proud. 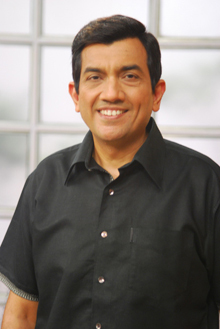 The Sanjeev Kapoor fan page on Facebook is now 4 lac fans in count. In such a short time, it has reached this pinnacle and I only wish this just grows tenfolds in the near future. I am really humbled and I would like to take this opportunity to thank all my fans, viewers and followers, without whom this achievement would not have been impossible. I wish that the constant love and respect that I’ve received from everyone over the years, just continues in the coming times as well. As well as a promise from my side that I will keep on bringing new and innovative recipes to one and all, for the love of food! Not to forget, my team back in the office who has been working day and night for such results. Kudos to all of you! Besides this, have some meetings lined up tomorrow in office and my team has already gone to Mahalaxmi to finalise the menu for an upcoming party.